It's poker night! 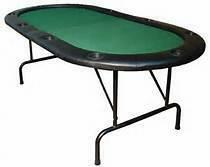 You're already winning when you give your guests an excellent experience by putting on your best poker face in style with this casino-like poker table in the comfort of your own home or selected venue. Imagine the exciting experience you and all of your players can have every poker night. Entertain your guests with this awesome table, built for a night full of excitement, suspense and winnings! Foldable with black-coated steel legs for easy storage after your night of fun-filled challenges is over.